Turner Area – Page 82 – Welcome to Wyandotte Daily! Chicken sandwich, French fries, baked beans, peaches and milk. Baked chicken drumstick, broccoli, mashed potatoes and gravy, dinner roll, applesauce and milk. Hamburger on a bun, tri-tater, red pepper strips, watermelon and milk. Cheese pizza, corn, tossed salad, grapes and milk. Corn dog, garden salad, baby carrots, pear and milk. Alternate entrees: Chef’s salad, fruit chef’s salad ,or yogurt and muffin basket. Teriyaki chicken, egg roll, rice pilaf. Barbecued rib on bun, baked cookie. Taco salad, beef, taco chips. Chicken nuggets, sauce, bread stick. French toast sticks with sausage. Additional Turner entrees include yogurt platter, and peanut butter and jelly platter. Fruit and veggie bar offered daily with lunch. Cheeseburger; mozzarella dunkers with marinara, oven fries, tomato mozzarella salad, melon, applesauce; turkey chef salad, tomato mozzarella salad, melon, applesauce, and blueberry fruit muffin. Chicken strips; chicken nachos with white queso, garden salad, Texas pintos banana, mandarin oranges; taco chef salad, Texas pintos, banana, mandarin oranges, and tortilla chips. Chicken patty – grilled chicken; homestyle meatloaf, mashed potatoes with gravy, glazed carrots, grapes, peaches and roll; chicken Caesar chef salad, glazed carrots, grapes, peaches, roll and crackers. Spaghetti with Italian bread; corn dog, corn, green beans, chopped garden salad, orange pineapple mix, applesauce; Italian chef salad, corn, orange pineapple mix, applesauce and Italian bread. Cheese pizza; peanut butter and jelly with yogurt, red peppers with hummus, Caesar side salad, broccoli with dip, melon, pears; popcorn chicken salad, peas, melon pears, and fruit streusel muffin. Chicken strips; chicken nachos with white queso, garden salad, Texas pintos, banana, mandarin oranges; taco chef salad, Texas pintos, banana, mandarin oranges and tortilla chips. Chicken patty – grilled chicken; homestyle meatloaf, mashed potatoes with gravy, glazed carrots, grapes, peaches, roll; chicken Caesar chef salad, glazed carrots, grapes, peaches, roll and crackers. Cheese pizza; sun butter and jelly sandwich with yogurt, red peppers with hummus, Caesar side salad, broccoli with dip, melon and pears; popcorn chicken salad, peas, melon, pears, and fruit streusel muffin. All menus from all districts subject to change. Chicken nuggets, dinner roll, tossed salad, grape tomatoes, tropical fruit and milk. Alternate entrees: Chef’s salad, fruit chef’s salad, or yogurt and muffin basket. Super nachos, refried beans, peas, mandarin oranges and milk. Alternate entrees: Chef’s salad, fruit chef’s salad, or yogurt and muffin basket. Cheese breadsticks with marinara sauce, garden salad, corn, pear and milk. Alternate entrees: Chef’s salad, fruit chef’s salad, or yogurt and muffin basket. Pulled pork sandwich, tater tots, baked beans, banana and milk. Alternate entrees: Chef’s salad, fruit chef’s salad, or yogurt and muffin basket. Hot dog on a bun, baby carrots, pineapple, green beans and milk. Alaternate entrees: Chef’s salad, fruit chef’s salad, or yogurt and muffin basket. Turkey sticks, gravy, bread sticks. Crispy chicken on bun. Fresh-baked cookie. Turner additional lunch entrée choices: Yogurt platter, peanut butter and jelly platter. Fruit and veggie bar offered daily. Chicken and waffles; three-cheese grilled cheese, cherry tomatoes, corn, broccoli, melon, mandarin oranges; turkey chef salad, corn, melon, mandarin oranges, and blueberry fruit muffin. Super nachos; chicken nuggets, garden salad, bean bake, pineapple, banana; taco chef salad, bean bake, pineapple, banana and tortilla chips. Chicken patty-grilled chicken; roast turkey, mashed potatoes with gravy, carrots, watermelon, applesauce, hot roll; chicken Caesar chef salad, carrots, watermelon, applesauce, hot roll and crackers. Barbecued rib on bun; chicken and cheese quesadilla, oven fries, cheesy cauliflower popcorn, grapes, orange pineapple mix; Italian chef salad, peas, grapes, orange pineapple mix, Italian bread. Corn dog; barbecued chicken on bun, carrots with dip, green beans, Caesar side salad, apple, fruit; popcorn chicken salad, carrots with dip, apple, fruit and fruit streusel muffin. Chicken and waffles; three-cheese grilled cheese, cherry tomatoes, corn, broccoli, melon, mandarin oranges; turkey chef salad, corn, melon, mandarin oranges, blueberry fruit muffin. Barbecued rib on bun; chicken and cheese quesadilla, oven fries, cheesy cauliflower popcorn, grapes, orange pineapple mix; Italian chef salad, grapes, orange pineapple mix, Italian bread. Canadian bacon pizza; corn dog, carrots with dip, green beans, Caesar side salad, apple, fruit; popcorn chicken salad, carrots with dip, apple, fruit and fruit streusel muffin. The Gibbs Road over I-635 Bridge Replacement Project completion date has been rescheduled with Gibbs Road reopening to traffic in late September 2014, and the overall project work scheduled for completion in mid-October 2014, weather permitting. According to the Kansas Department of Transportation, the start of construction on the project was delayed by several weeks, due to issues related to the advance work on the clearing of utilities. 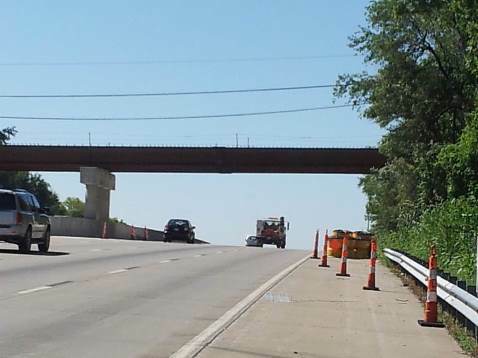 Despite the hard work of the contractor and KDOT construction staff, the bridge project simply isn’t going to make the originally scheduled completion date, according to KDOT. During these last couple of weeks, the girders for the new bridge structure were set in place during overnight closures on I-635. Next steps include the installation of the formwork used to support the bridge deck, followed by the concrete pour for the new bridge deck.